Before looking at painting in the Early Renaissance, we need to learn about the discovery or rediscovery of linear perspective sometime close to 1420 by Filippo Brunelleschi (rediscovery, because the ancient Greeks and Romans may have understood linear perspective too, but if so, knowledge of it was lost during the Middle Ages). Linear perspective is a way of creating a convincing, perfect illusion of space on a flat or two-dimensional surface. Nearly every Renaissance artist wanted linear perspective—a way of creating an accurate illusion of space that could match the new naturalism then being applied to human figure. 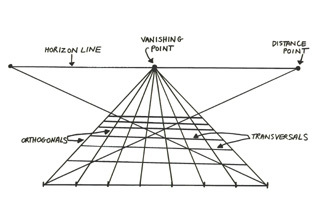 Diagram of the main elements of linear perspective—horizon line, vanishing point, and orthogonals. When Brunelleschi (re)discovered linear prespective circa 1420, Florentine painters and sculptors became obsessed with it, especially after detailed instructions were published in a painting manual written by a fellow Florentine, Leon Battista Alberti, in 1435. John Berger, an art historian, notes that the convention of perspective fits within Renaissance Humanism because "it structured all images of reality to address a single spectator who, unlike God, could only be in one place at a time." In other words, linear perspective eliminates the multiple viewpoints that we see in medieval art, and creates an illusion of space from a single, fixed viewpoint. This suggests a renewed focus on the individual viewer, and we know that individualism is an important part of the Humanism of the Renaissance. This site was SO helpful for my assignment. Thanks a heap! The video was most helpful. The visuals and verbal explanation really helped a variety the of learning strengths in my mixed high school studio classroom. I will also suggest the site to my beginning college students. Thank you. The video is very helpful, but the English subtitles are inaccurate which is a big drawback for smarthistory. To post a comment, you need the Adobe Flash Plugin. Download it from here. This work is an open educational resource and This work is licensed under a Creative Common Attribution-Noncommercial-Share Alike 3.0 license.